Four, potentially 5 stacked targets. Over 3 billion barrels of oil (best case, gross prospective, unrisked). One well, and just a few weeks now til spudding. 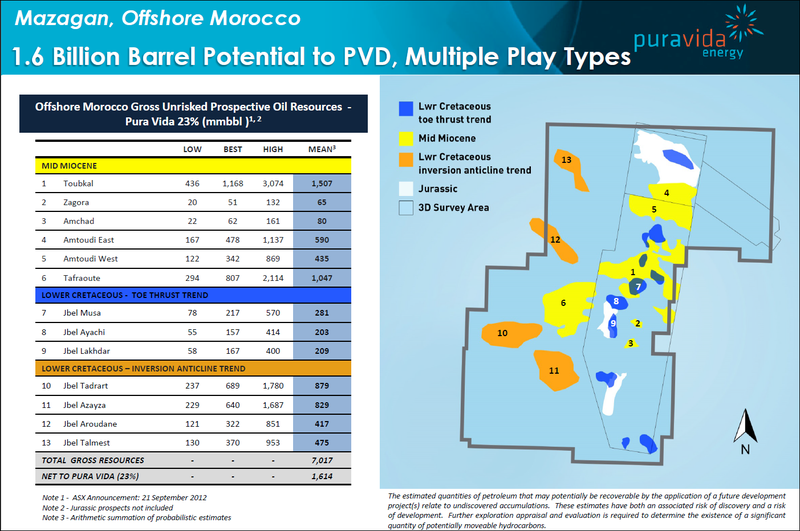 Pura Vida Energy (ASX:PVD) has reprioritised its drill targets offshore Morocco and will now be drilling a deeper well first, followed by a second shallower well later in 2015. This is more bang for the buck – with multiple vertically stacked targets, the overall chance of success from one well increases. Oil wells are typically binary events, but this one is different. It’s not just one roll of the dice but four or five – giving it the best chance of finding oil and realising huge potential upside for shareholders. However, it’s still offshore oil exploration, and therefore it’s still high risk. They may not strike oil on this well. But we won’t have long to find out a result on this well – drilling is due to commence in the New Year. Total net prospective resources, mean unrisked, to PVD is 328 million barrels. PVD and its Joint Venture partner, Freeport-McMoRan Oil & Gas LLC, have been poring over the technical data, working around the clock over recent months and made a unanimous decision to switch to a new target within the Mazagan Permit called the ‘Ouanoukrim prospect’ (pronounced WON-OO-KRIM). The first high impact well there will be called MZ-1 . MZ-1 will target four, potentially five, independently risked stacked prospects compared to the original Toubkal well’s one prospect, and go far deeper than Toubkal to test the full stratigraphic section of the Mazagan basin. A deeper well means greater cost, however PVD is already free carried for US$215M, which should be sufficient to cover costs for both a deeper well and a shallow well. In order to mitigate the impact of potential cost overruns, PVD has secured an option for additional carry. This financial safety net can be used only if necessary. PVD is now capped at under $50M, only a few weeks out from such a high impact drilling event – the current price of oil no doubt has something to do with PVD’s current discounted share price. However we believe the market has overreacted in the case of PVD. PVD’s projects are large-scale conventional oil opportunities which translate to relatively high margins per barrel and are therefore economically robust even at lower oil prices. We believe PVD is significantly undervalued given the circumstances in the run up to drilling such a large potential resource. In a success case, we would expect multiple uplifts from PVD’s current share price. Now that the target has been locked in, we are expecting a pre-spud ramp up as investors pile into the PVD drilling event. Due to the range of play types in the Mazagan permit, PVD and Freeport were always going to drill a deeper well – they have just upped the stakes in the first well now. 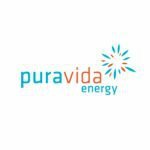 We first put the $45M market capped Pura Vida Energy (ASX:PVD) on our investment radar back in August 2013 with the article Why has this stock got analysts predicting four thousand percent gains? 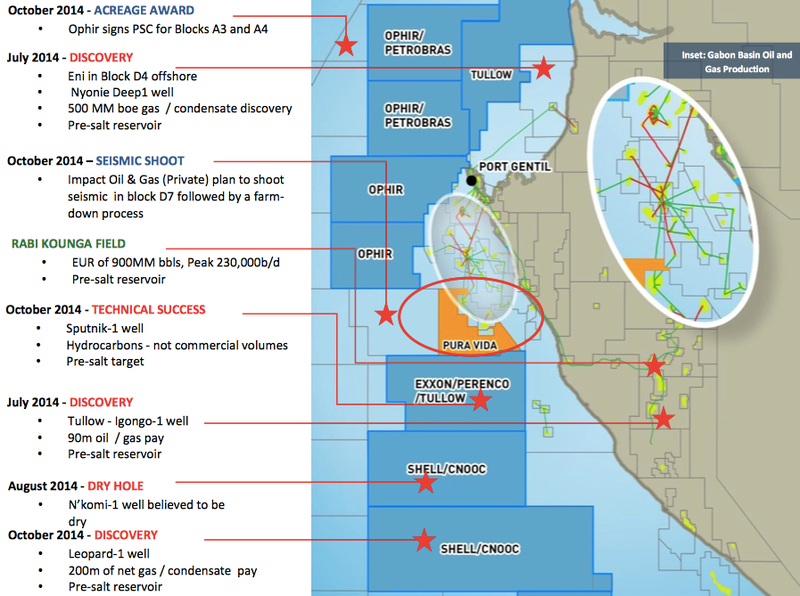 PVD scored one of the best farm out deals to date in offshore Morocco, and did this by moving early and beating majors like Chevron, BP and Woodside to the most prospective permits. Freeport-McMoRan will cover the cost of drilling TWO wells up to $215M in exchange for a 52% stake – leaving PVD with a 23% cut and Morocco’s government taking the remaining 25%. An additional financial safety net has been signed by PVD to deal with cost overruns greater than this – more of this below. As you can see above, the Ouanoukrim prospect is in a critical location where multiple objectives are stacked one on top of the next. This allows a single vertical well to test the traps of multiple plays and intersect the source rock. We have invested in PVD for some time, and now we are on the cusp of the biggest event in PVD’s life to date. PVD, its JV partner and the Atwood Achiever drill ship remain full steam ahead to spud the offshore Morocco well early next year... but now they have a bigger, deeper and more comprehensive target... the Ouanoukrim prospect. In this article we’re going to run you through all the vital statistics of this new well location and see why PVD and Freeport decided to make the switch. PVD and Freeport’s 2015 drilling programme for offshore Morocco is set to commence in early 2015. As you can see in the map above, the Ouanoukrim prospect is just to the north of the Toubkal prospect, so geographically it’s not a major change. The big differences at Ouanoukrim are geological. The MZ-1 well, will test a total mean prospective unrisked resource of over 1.4 billion barrels at Ouanoukrim; with a high case of over 3 billion barrels (over 300 million barrels net to PVD). 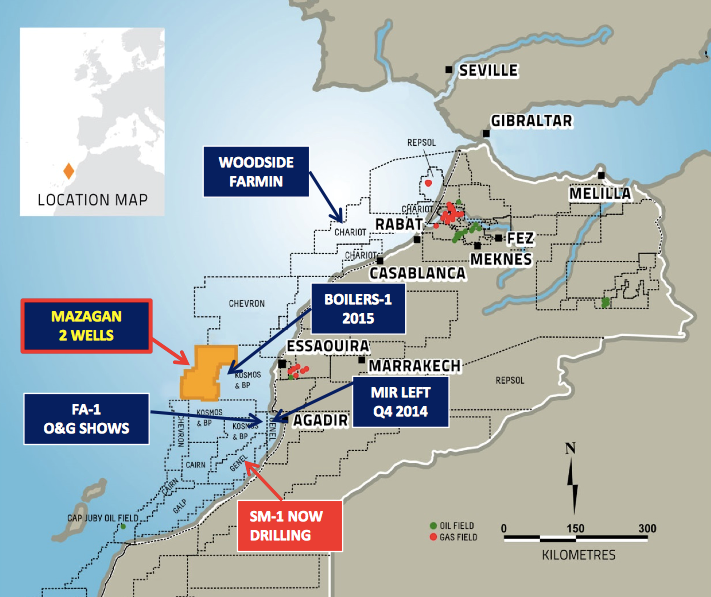 Overall, the MZ-1 will be targeting a similar size resource to what was planned for Toubkal, however MZ-1 will have more independent prospects to test, diversifying and improving PVD’s chances of striking oil. 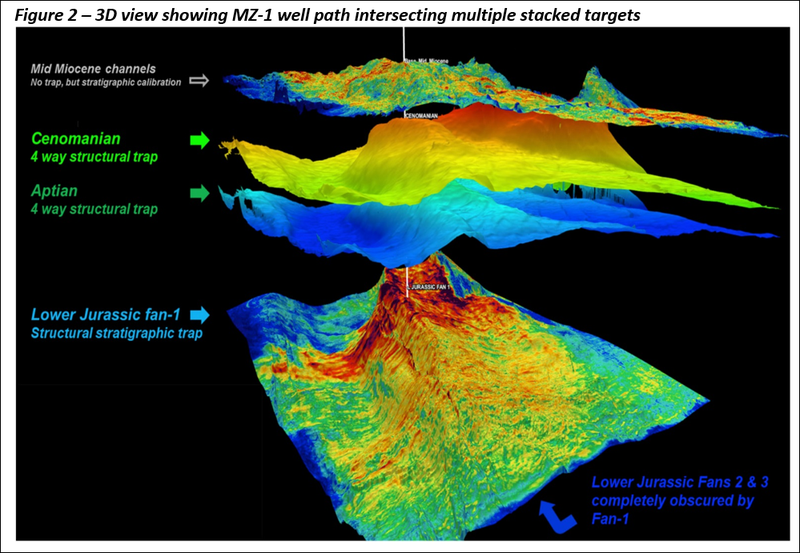 The new, deeper MZ-1 well will be drilled to a depth of 5,600m and has the potential to go even deeper to 6,150m. This will allow the testing of four and potentially five (if the well drills deeper) independently risked stacked prospects instead of the single objective at Toubkal. Because it will go so deep, the new PVD well will test the full stratigraphy of the Mazagan block, a crucial advantage compared to Toubkal. Finally the shallowest level of interest is the Tertiary mid-Miocene channels – the same age as the Toubkal prospect. Critical logging will be conducted from here down to the Jurassic to obtain data across the full stratigraphy of the basin – helping to inform the location of well number 2 later in the year. All of these ancient, potentially oil bearing layers will be hit with a drill bit at MZ-1, giving PVD a picture of what’s at the Ouanoukrim prospect and the wider Mazagan permit. 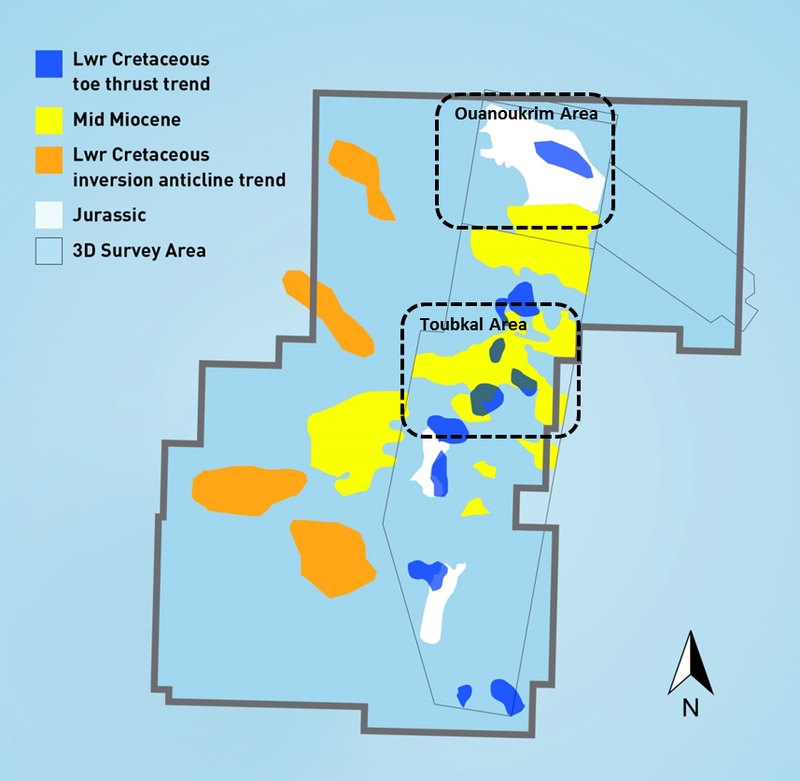 The bottom line is that the Ouanoukrim prospect is an ideal location where all the ingredients for an oil discovery are present. 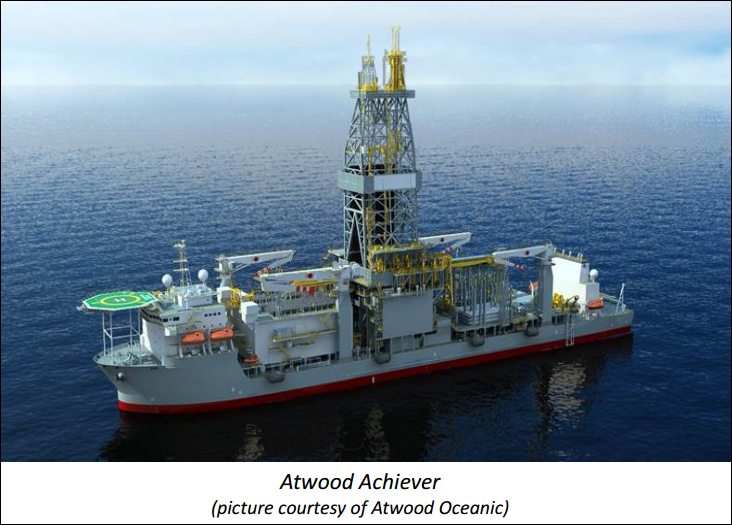 The Atwood Achiever ultra-deep water drill ship will be used to spud the well, and when work begins in early 2015, it should take a number of weeks to reach target depth. At The Next Oil Rush we believe that the decision to drill deeper first is a sensible move by PVD and Freeport which is backed up by sound technical work. 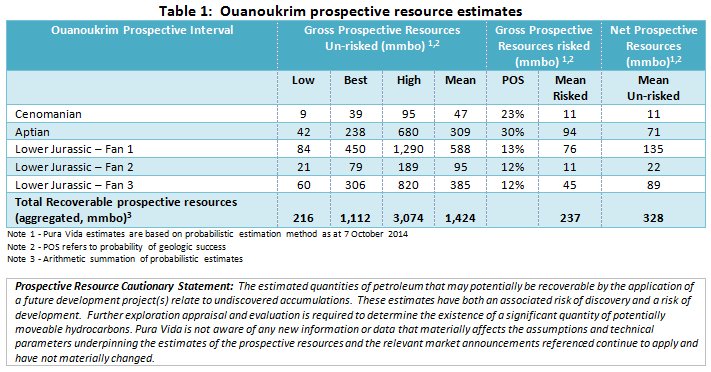 The MZ-1 well at the Ouanoukrim prospect will test four to five prospects instead of the one at Toubkal, meaning there is a greater chance of finding oil. The total prospective resource size is similar, but the Ouanoukrim prospect offers a chance to see the full stratigraphy at Mazagan. The MZ-1 well at Ouanoukrim should therefore provide valuable data that will assist in selection of the second well, planned for H2 2015. For now, all focus is on the maiden well and PVD reckons on a cost of US$136.6M, well within the $215M free-carry limit it has with Freeport for two wells. But oil exploration is inherently risky, especially offshore exploration, so in addition to changing its drill target to increase its chances of success, PVD has taken precautionary steps. The MZ-1 well at the Ouanoukrim prospect has an estimated cost of $136.6M and PVD says that’s a robust figure that takes into account 20% rig down time plus 10% contingency. But $136.6M is a lot of money, double the $60M estimated cost of the original Toubkal well. So if there’s a cost overrun, there is a chance that cash for the second well in the deal reduced. To mitigate this risk, PVD has struck a deal with Freeport that will protect that kitty; an option to be free carried beyond the $215M cap in exchange for 1% of equity for every $4.5M of gross extra well costs that gets spent – and PVD has sole discretion to use it. Under the deal, PVD’s interest will never drop below 4% of the JV, regardless of costs. That said, PVD may not even need to use this option, it will all depend on final well costs. To us at The Next Oil Rush this is a safety net that allows the company to maintain a strong financial position for the maiden drilling event and beyond. So now we know all about the new drilling target for PVD and Freeport, the Ouanoukrim prospect, and its move to extend the free carry – just in case. The decision was mutual – both sides of the JV agreeing to change from Toubkal to Ouanoukrim after an intensive technical review, including 3D seismic reprocessing. Their joint conclusion is that the Ouanoukrim prospect and the MZ-1 well offers the best chance of success for shareholders. This is the crucial point. A maiden well is a big deal and if you get it right the first time the rewards can be enormous and fuel everything else you do afterward. Freeport is laying down a lot more money to drill deep, and PVD is backing them – all of it based on thorough technical work. That’s a solid JV partnership. 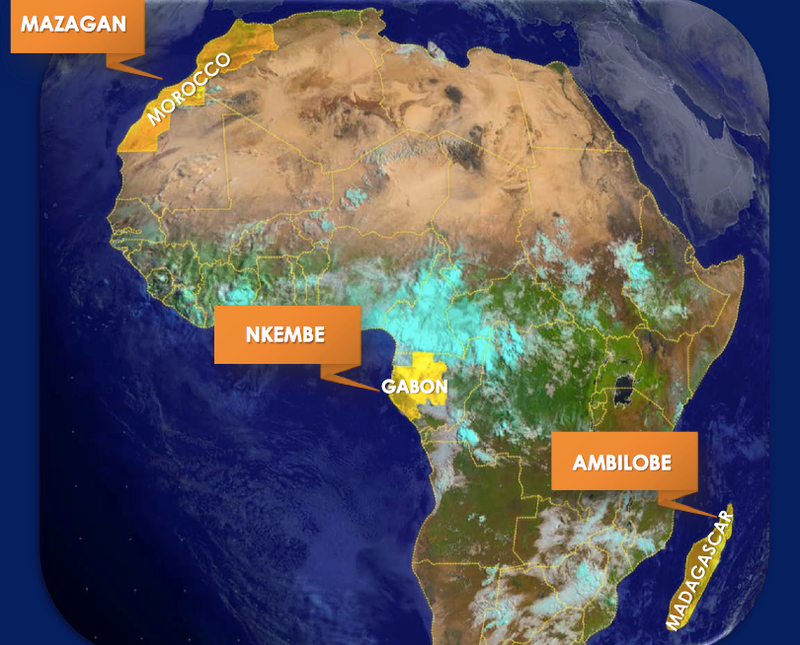 PVD also has significant oil projects offshore Gabon and Madagascar – and both plays are moving along at a good clip, promising a big 2015 for PVD across its assets in Africa. The Madagascar project is called Ambilobe , and PVD and its partner Sterling Energy Plc (LSE:SEY) are planning to shoot a comprehensive seismic programme there, starting early 2015. 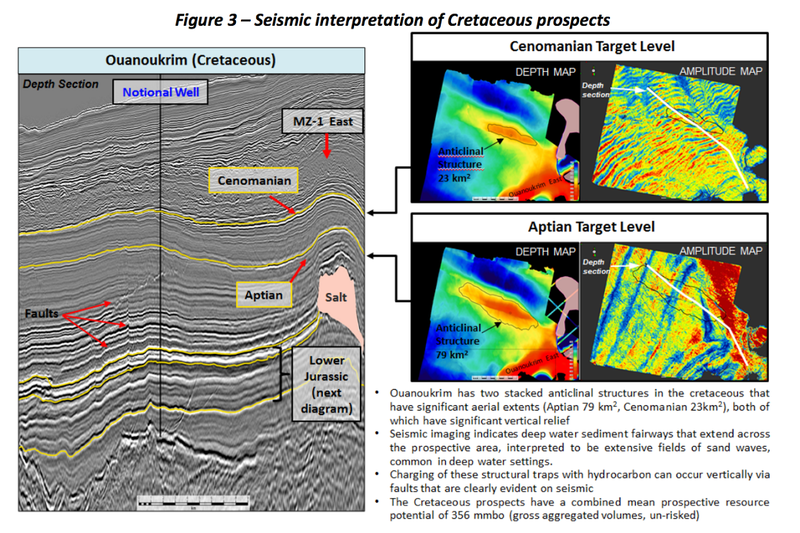 1,250km2 of 3D seismic will be shot over the prospect to identify drilling locations. PVD will carry the costs of this programme to the value of $15M, after which both partners will contribute evenly, though the cost is expected to be $10M. The intriguing aspect at Ambilobe is the salt plays, similar to the big oil bearing salt plays in West Africa. This has led to a flurry of activity in the areas surrounding PVD’s project. The main thing at Ambilobe will be to identify some drillable prospects in 2015 and move toward exploring them in 2016. PVD is surrounded by discoveries and technical successes, with a significant 80% interest in their acreage, chasing pre-salt plays similar to the big oil bearing ones you can find in Brazil. There’s a total net mean prospective resource of over 1.3 billion barrels at PVD’s Nkembe Block. The big news for offshore Gabon is that there’s been several discoveries, including Eni’s 500mmboe gas/condensate hit in a pre-salt reservoir and Tullow’s 90m oil pay. Total’s Leopard-1 well also discovered a large gas field with 200m of net pre-salt reservoir. The Australian stockbroking firm Hartley’s says these discoveries in the area that PVD is operating in significantly de-risk its offshore play , and could enhance the company’s chances of securing a farm-out partner. So right the way across Africa, from Morocco in the North to Gabon on the West Coast to Madagascar off the Eastern shores – PVD is pushing ahead. At The Next Oil Rush we’re counting the days until the New Year. PVD’s maiden drilling programme is slated to kick off early in the New Year at its brand new target, the Ouanoukrim prospect, where the MZ-1 well will drill down into multiple stacked prospects. We’ll be on the lookout for any news on this – particularly the arrival of the Atwood Achiever drill ship in Moroccan waters. The MZ-1 well at Ouanoukrim has four, potentially five chances of success, will test a total mean prospective resource of over 1.4 billion barrels, and explore all the geological layers present at the wider Mazagan permit.